I’ve been a full time children’s entertainer for over eighteen-years and, in that time, I’ve learnt that children really do say the most hilarious things. In this blog I thought I would share with you some of the funniest things I’ve heard children say. “So, Phoebe, do you have any brothers or sisters,” I asked the six-year-old girl. Four-year-old Chloe, who was helping me perform some magic, suddenly and unexpectedly announced that she’d had a — pig and cow sandwich for breakfast. I was just as confused as the rest of the audience until her mother explained what she’d actually had for sausage sandwich, the sausages being made of — pork and beef. On asking Emma how old she was she confidently replied, “I am seven, going on eighteen.” She was obviously repeating what she’d heard her mum say when she was asked about her daughter’s age. After being asked where he’d been on holiday Michael stood and thought for a moment before replying, “I went to India, and while I was there I saw the Eiffel Tower.” — Now there’s a novelty. Gemma and Stephen were helping me on stage and at the end of the trick I asked Stephen to shake Gemma’s hand. Stephen shook his head defiantly and refused. “If you don’t shake Gemma’s hand, I’ll get her to give you a kiss,” I responded Jokingly. “No, no,” I said it’s not a crab, I’ll tell you what it is - it’s a teddy Bear.” I turned to the little girl and said. “I bet you’d much rather have teddy bears than crabs.” — Oops! No Sunny Spells, Just Magic Ones. Working at an out door event can see an entertainer having to deal with allsorts of problems, including bad weather conditions. 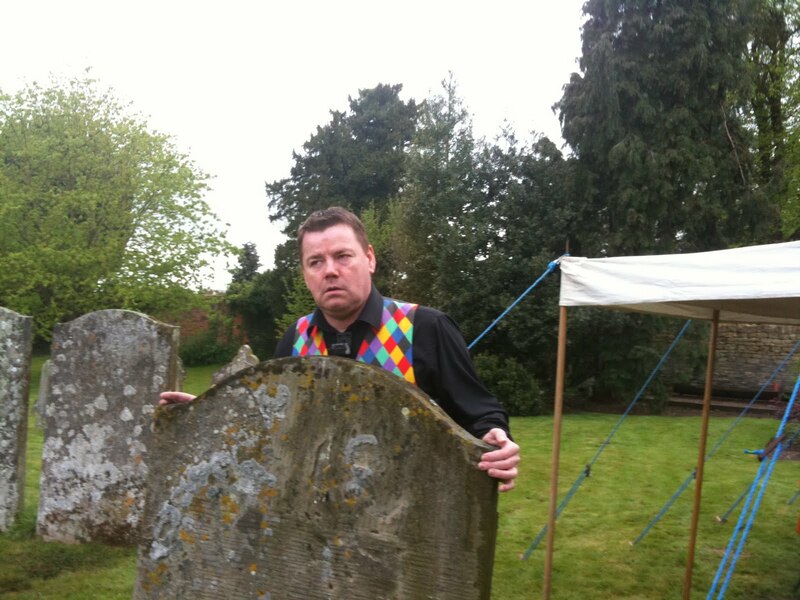 And at my latest gig, The Cropthorne Walkabout, the weather really did put the dampers on the day. Over the last thirty-years, the Cropthorne Walkabout has firmly established itself as a favourite attraction for all those interested in a great day out soaking up the peaceful charm and history of rural England, and it’s also a great family day out too. Take a leisurely stroll through this picturesque Worcestershire village and you will not only see some of the most spectacular and striking gardens in the area but you will also encounter some wonderful attractions including: a Jazz Band, Morris Dancing, Boat Trips, a Hawk and Owl display, a Classic Car and Motorcycle Exhibition, a Fully Licence Bar, a Pig Roast, various stalls — and a Magician. 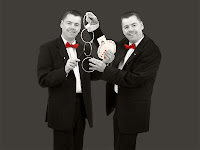 Yours truly was booked (for the umpteenth year) to provide the magical entertainment, predominately, for the children. My performances were to take place in a marquee that had been erected within the grounds of the Cropthorne Churchyard. As I arrived I became immediately aware of how few people were around compared to previous years. It was obvious that the bad Bank Holiday weather had already taken its toll on the event. I started my first show at 2:30pm. In previous years the marquee would have been full to bursting, but this year there were only fifteen little ones, with, of course, their parents. I started the show and everything was going well, but with rain now falling heavily, the marquee was starting to leak and on several occasions I was forced to move across to avoid the water that was now constantly dripping down. By the end of my show, the marquee was completely full with people (mainly adults) — who weren’t really there to watch the show — but who needed shelter from the torrential rain. Once the show was finished the rain slowed to a fine drizzle and the crowd slowly dwindled, finally leaving me to re-set everything for my second performance, which was due at around 4:00pm. But it wasn’t long before the heavy rain returned and soon the Churchyard and was almost deserted, and with rain falling and skies becoming dark and overcast, it really was quite eerie. Occasionally I would see the odd passer-by, with their umbrella’s up, heads down, braving the elements — but, I think the fact there were now actually more stallholders than visitors says it all. The bad weather really did put the dampers on the rest of the day, and needless to say, that my last show never had a chance of starting. No audience, no show. One family did walk by with a little boy whose name was Noah — a very appropriate name considering the weather we were getting. I made the little lad a balloon animal and showed him some magic as well. That family turned out to be my last customers of the day. It’s shame after all the hard work that goes into organising an event such as the Cropthorne Walkabout that it should be spoiled by the weather; but you can’t really blame those who had intended to pay a visit and then decided against it once they’d seen the weather forecast or those who left early for the same reason. Don't think there is an answer and there's certainly no one to blame. All you can say is grit your teeth, smile and say - that’s life - and hope that next year the sun will be shinning. How did I become a magician? I thought I’d try and answer two of the questions mentioned in my last blog. So here it goes. Most of us will, at some point, have received a “box of tricks” for Christmas. I did, and, from that moment on my life was changed forever. I sat their everyday practicing the tricks until I had mastered everyone. I remember nervously performing a card trick that had took me days to learn. My whole family sat and watched and I remember the shocked look on their faces as they released they didn’t know how I'd done it. This ten-year-old boy, who had probably never done anything amazing in his life before, had fooled the pants off them; they really hadn’t got a clue! It was such an incredible feeling, the adrenalin rush. And for little old me to have entertained, amazed and fooled my whole family was amazing. I wanted more of that feeling. I couldn’t wait to go back to school to show my friends the magic I’d learnt. My school friends were very receptive to the magic I showed them. Some of them had the same box of tricks but just could work out how to perform them properly, and that was the difference! When my friends were giving up after a few tries, pushing the magic under the bed and playing with their Subbuteo football game instead, (Subbuteo – now there’s a memory), I didn’t give up! I wanted to perfect the tricks and then I wanted to learn more. But in thoses days, unlike now, magic tricks were not so readily available. Now, you don’t even have to leave the house to find out about or buy magic. You can surf the net and find allsorts of magical effects, online magic stores, books and dvd’s. Ebay is full of tricks at giveaway prices and there are dozens of different magic sets available. But in thoses days, all those years ago, there was nothing like that. The only way I found out about more magic was while on a visit to my local library. There I discovered a fair selection of books about magic and the allied arts. I think I borrowed everyone of those books and it became obvious that I was obsessed with becoming a magician. The obsession never left me; once magic gets you hooked there is no way to stop the addiction; you can’t go to the doctor and ask for a patch to stick on your arm – nope! That’s it, once the magic bug has got a hold of you, it will never let go. I am now a full-time professional working for myself, doing a job that I love and not many people can say that. I perform at many different events and venues performing not only as a children's entertainer, but also as a close-up magician too. Close-up is as the name suggests magic that is performed at close quarters to the audience. I will walk around, mix and mingle with the guests, performing amazing feats of magic and mind reading at their finger tips - miricles no-less. So every time I go to work, its always different; different audiences, different reactions, different venues and different hecklers too. It's great doing what I do, I just love it - even on the bad days - and there are some. I wouldn't change my job, (If you can call it a job) for the world. Do I always look forward to going to work? The answer is most definitely yes! Don't forget any questions - please ask.